Backcountry ski hokkaido at Tomamu, Yubari Range, Sounkyo, Kuro Dake and more. This tailored tour includes lift access and backcountry skiing at Tomamu and Furano, Yubari Range, Sounkyo, Kuro Dake and Kitami Pass. Both Tomamu and Furano have excellent lift serviced access to nearby backcountry bowls, where you can climb & ski wilderness runs in superb terrain. From there you can travel to the stunning Sounkyo Gorge in the north of Daisetsusan National Park. Here, from your small Inn in this hot spring village, your guide will choose from either the nearby slopes and peak of Kuro Dake or the rarely skied area of Kitami Pass. For more information on these areas, visit our Locations page. 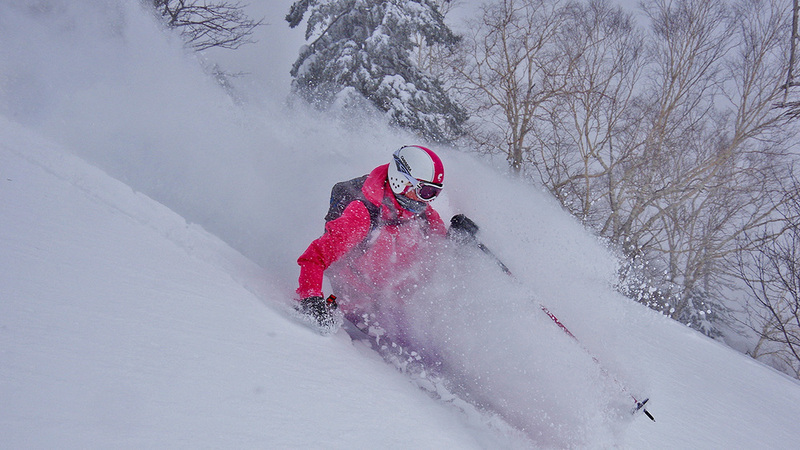 Paul "Stretch" Daniel, deep in the Hokkaido Powder. Photo: Tim Macartney-Snape.